"Step into a world of magic, fun, and cookies!" 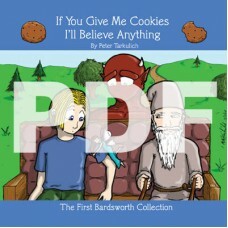 Get your hands on the first print collection of the webcomic, Bardsworth! Relive the beginnings of the world of Bardsworth or enjoy it for the first time. Fully colored with commentary on each strip, a sketch gallery, and The Ballad of Kamius Morclimer. Read on your e-reader of choice or on your computer. This is a PDF version of the print book. "Welcome to Bardsworth University! "Mike Cosley is a freshman..